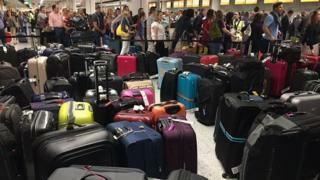 A fault with Gatwick Airport's baggage system meant flights were leaving without passengers' luggage. The airport said the problem had now been resolved and it was working with airlines to get luggage to passengers "as soon as possible". Passengers reported long queues at check-in desks on Friday. Departing flights from the north and south terminals are affected. The system for handling luggage from arriving flights has not been affected. A spokesman for Gatwick Airport said: "Arrivals, and those travelling with carry-on baggage only, were unaffected by this issue and all bags and passengers were security screened as normal." He said the problem with the automated baggage system had now been fixed and the airport was now working to remedy the disruption caused by a backlog of luggage. Passengers have taken to social media complaining of a lack of information from airlines at the airport's check-in desks as the airport begins one of its busiest weekends of the year. Charles Duffield tweeted: "Total shambles at Gatwick this morning." Phil Collins also posted on Twitter: "Absolute chaos @Gatwick_Airport multiple gate moves, multiple flights from the same gates and staff ask us for advice and info #BankHoliday." EasyJet said the problem had been caused by a baggage belt failure.